A campaign against plans to cut a deaf studies programme at Bristol University is being stepped up. An emergency motion was introduced at the start of the Trade Unions Congress (TUC) disability conference to back the campaign to save the course. Protests were held in Bristol last week against the proposals which could lead to nine job losses. The university said the degree was going for academic reasons, as part of a review of the social science faculty. The TUC motion called on delegates to sign a petition on the social networking site Facebook, opposing the cuts. Sally Hunt, general secretary of the University and College Union, said: "[The TUC], like us, recognise the incredible work the staff in the centre do delivering one of the only degree courses in deaf studies. "Closing the course would have ramifications for deaf people throughout the country. 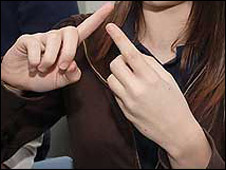 The options available to people wishing to learn sign language, or how to teach it, would also be massively reduced." A spokesman for the university said: "The money-saving aspect is a secondary reason. The BSc is being withdrawn because of academic considerations. "Part of this is to due the students' own assessment, but also its relevance to the wider interest of the faculty."